Earth Day is the perfect time to discuss green cleaning, the growing trend of using environmentally-friendly ingredients and/or packaging for your household cleaning. • Some cleaning products contain ingredients that pose health hazards and/or harm to the environment. • Cleaning products are frequently involved in home poisoning, many involving children under the age of five. • According to the US EPA, levels of pollutants indoors can be two to more than 100 times higher than outdoors, and the number one culprit for indoor pollution is our use of cleaning products. 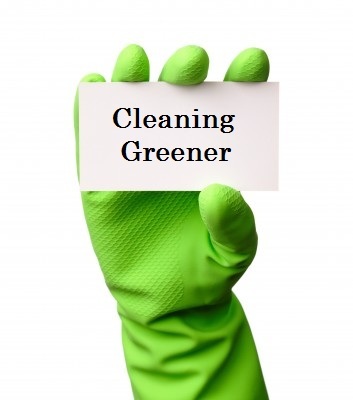 Contrary to popular belief, green cleaning doesn’t have to be complicated, expensive or time consuming. Here are some quick and easy tips that you can start implementing today. • Buy rags or cloths instead of paper towels and wipes. 3. Look for eco-friendly ingredients like grain alcohol (instead of toxic butyl cellosolve), plant oils (rather than petroleum) and plant-oil disinfectants such as eucalyptus (not triclosan). 4. Avoid toxic ingredients such as nonylphenol ethoxylates, antibacterials, ammonia, butyl cellosolve, butyl glycol, ethylene glycol, monobutyl, chlorine bleach, d-limonene, diethanolamine and triethanolamine. 5. Be on the lookout for “greenwashing,” misleading claims regarding product eco-standards. There are no standards for words like nontoxic, eco-safe, environmentally friendly, natural and green. Read the labels and research products before purchasing them, and look for third-party certification. Also note that unless you compost them, biodegradable containers end up in the landfill, where very few things ever degrade. 6. Make your own cleaners with ingredients you already have in your cabinets. These cleaners are less expensive, safer and more environmentally friendly. One of the best sources I’ve found is Apartment Therapy’s 25 Green Cleaning Recipes for the Entire House. Let me know what you think about green cleaning! Are you already using some of these tips around your home? If so, how do they work for you? If not, which one(s) are you willing to try? Do you have a tried and true recipe for green cleaning? Please share it!